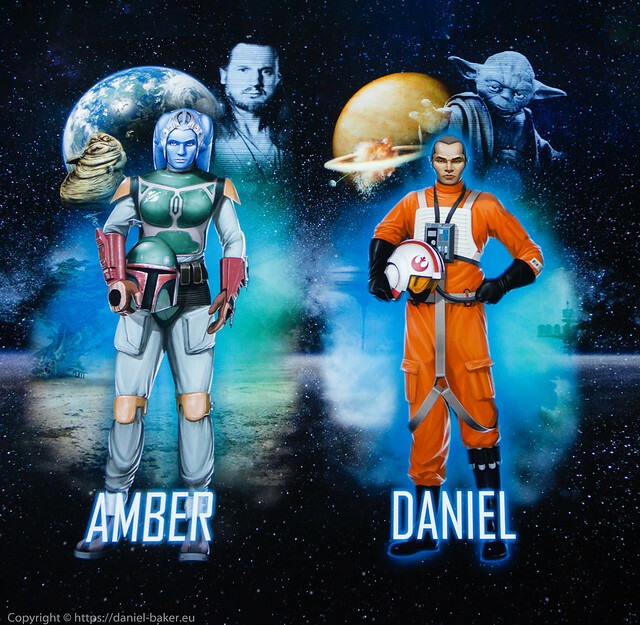 My Goddaughter bought me tickets for Star Wars Identities at The O2 in London for Christmas, last week I went and it was great. The night before we set off I only managed about two hours sleep, it’s a fairly regular thing at the moment due to stress and worry, so getting up at seven AM I wasn’t sure if I would cope with the day. I attempted dozing on the journey with little luck as I tend to choke as I fall asleep in the wheelchair instantly waking up again! We arrived a bit late due to London traffic and then problems finding the disabled drop off point as there was work being done on the car park, luckily the parking attendant was helpful and directed us, it turned out the disabled parking was free which was a surprising bonus. It was absolutely freezing on getting out of the car, but dry at least, we headed for the entrance quickly, on entering security waved me through which is always nice, the PA had to be checked and scanned though which amused me. Inside it wasn’t any warmer and the wind noise was tremendous, there’s no way anyone could have heard me speak so I was lucky the PA was there. We found the exhibition and to my surprise there was no waiting even though I had missed my twelve o’clock slot, we were directed through the shop to the lift and headed in. You are given an earpiece and RFID wristband when you enter, the earpiece plays an audio description of exhibits as you go around and the wristband is used to identify you and build your “Star Wars Identify” at selected stations. There is lots of information as you walk though, I learned some interesting things about Star Wars and it’s creation, I also forgot lots by the end of it as there was so much to take in! There was lots of talk about identify and how people fit in which was tied to the Star Wars themes and characters, it’s an interesting idea and maybe schools should consider talking GCSE sociology students on the tour, for me though it got a little tiresome by the end. What I was most looking forward to was seeing the props and photographing them, there’s no flash allowed and no tripods so getting good images in the subdued lighting is tricky, luckily for me my camera is attached to my chair which acts as a tripod, this meant I could take three pictures of everything then median stack them in Photoshop to reduce noise (incidentally my Photoshop license has just run out so if anyone at Adobe wants to give me a Photoshop CC license I’d be happy to post lots of nice Adobe cool aid). I won’t list all the props here, there were lots and also lots of sketches and designed, I would have liked some larger props or even sets but I am not complaining. DANIEL – MALE HUMAN – I was raised on the gas planet Bespin, where members of my community made their living extracting Tibanna gas from the atmosphere. On holidays my friends and I would traditionally watch the cloud cars race just off Cloud City. My parents gave me independence and not much by way of support, but I suppose I did inherit my strong set of intellectual abilities from them. 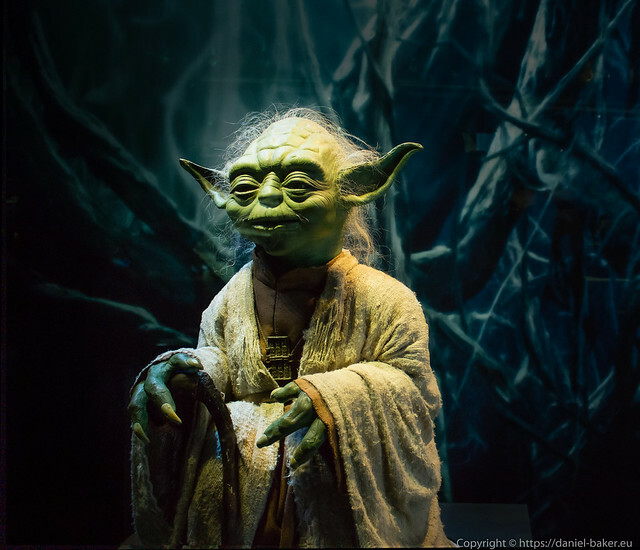 Later on I spent some time with Yoda, the greatest of all the Jedi, whose guidance left me with knowledge I still use every day in my job as a fighter pilot. I remember this one time when I watched a cruel despot destroy my home planet. I found it very hard to deal with this; actually, after it happened I floated aimlessly through the void, singing the sad old songs of my childhood. People often tell me I’m a generally adventurous and curious person, I also tend to be organised and prepared. But the most important thing to me is achievement: I believe that excellence deserves recognition and respect. I am moderately sensitive to the Force; I guess that’s why the Emperor took an interest in me. When he offered me limitless power in exchange for my allegiance, I fought the urge to join him and his evil minions and rejected his offer. As you finish you get shown your Star Wars identity on a big screen which is rather cool, you then head back through the shop, I really wanted to buy a baseball cap to remember the day but at £20 I just couldn’t justify it. 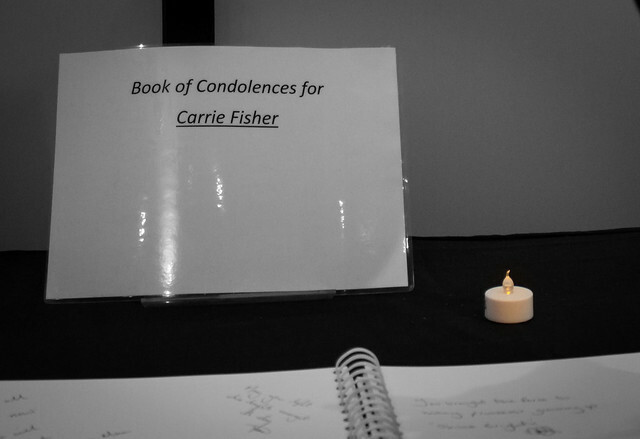 We headed back downstairs and saw a remembrance book for Carrie Fisher, there were lots of touching messages from fans and I added my own “Thanks for the beard stroke, Love Daniel”, I wish I could have thought of something more touching but I’m no wordsmith, it was personal though. We headed back through the noisy and cold O2, stopping off briefly at the Nissan Innovation Station where I “forced” my PA to play Daytona. Outside we quickly headed for the car and set off for home, the satnav decided not to take us back under the tunnel but through Lambeth and Peckham instead, it took rather a while to get back on the motorway. I was completely exhausted by the time I got home but amazed myself by not having an anxiety attack or feeling too ill during the day, especially as I had forgotten to eat and take Diazepam before leaving, I did sleep well that night though! This entry was posted in Photography and tagged accessibility, Daniel Baker, Identities, Millennium Dome, Star Wars, The O2. Bookmark the permalink.